The world is still reeling from the tragic loss of Princess Leia actress Carrie Fisher, who passed away this week at the age of 60. Many of Fisher's friends and colleagues have shared their thoughts on her passing over the past week, including her The Force Awakens and Episode VIII co-star Oscar Isaac. The Poe Dameron actor has poster several messages of love and support for Carrie and her family over the past few days. His latest shows Fisher and Mark Hamill behind the scenes on the set of Star Wars Episode VIII, giving fans their first look at the costumes worn by Luke Skywalker and General Leia Organa in the upcoming film. The costumes, from what I can tell, look pretty cool. Hopefully we'll get a better look at them at Celebration in Orlando. Deadline also reports that fans can expect to see General Leia take on a bigger role in Episode VIII. 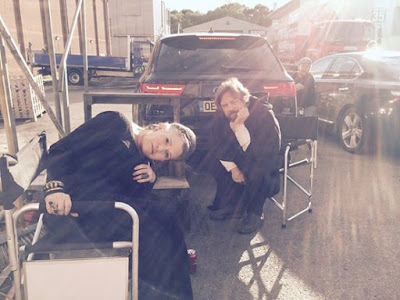 In the meantime, the important thing right now is Oscar's message of love for Carrie and take solace in the fact that we get to see one more appearance by Carrie as Leia in 2017.